A dark tale of seaside romance. Written by Andy Bullock. Illustrated by Michael Holyoke. Say hello to Big Brenda Bagley. Big Brenda Bagley was very big and very Brenda. She lived in a small grey house with a matching cat, in a small grey seaside town, that would like to be a bit more Brighton but was less than Bognor. A town that had been studiously overlooked by the new wave of south-coastal migrants from London seeking a new-wave life of lentils, lattes and chi-chi retro cafés. This was a real English seaside town, where the only thing on the up was unemployment and the only shops opening were selling everything for a pound which made the charity shops look expensive so they were now all closing down. There was however one splash of colour in Brenda’s otherwise monochromatic life – her van. Not just any old van; it was an ice cream van, all pastel shades, sparkly stars, pale yellow sides and a sky blue roof, topped off with a smiling mister whippy and a fading seaside tune. It was her work, her living, her life. It contained her passion and guilty secret too. Each day Brenda said goodbye to her small grey house and her matching cat and squeeeeeezed into the van to drive through the town of drizzle and mist, to her seaside pitch on the promenade of dreams by the sea of no hope, where she sat and gazed and grazed. And graze she did, day in, day out, on ice cream fantasies fit for a queen of any daytime tv dream. She arrives at her pitch in the seafront car park facing the grey-green impressionistic sea which is framed by a defunct, dilapidated, dysfunctional pier on one side and a seaweed-cloaked breakwater on the other; the cold sea ironically peppered with plastic mineral water bottles bobbing around like indestructible ducks, destined to sail the seven seas ‘til the end of time. She turns around with difficulty in her woefully small driver’s seat and squeeeeeeezes her way through the van, past the counter, to her chair for the day at the back. The van, although primarily for making and selling ice cream confections, also doubles as Brenda’s mobile library. A library of bottom shelf trash mags. “OK! HELLO!” the titles scream, plastered over the permatanned bodies and titanium-white smiles of ‘so-called’ celebrities. She is a fully paid up member of this C-list worshipping religion, it takes her mind off the utterly dull pointlessness of everything in her own life. From her seat she can mentally blank out the grey, the drizzle, the mist, the wind and the sheer dismal awfulness of it all, and immerse herself in a world of impossible beauty, perfect bodies; of surgically enhanced physiques and digitally remodeled faces. Here she would sit day after day, the monotony broken only by the occasional hardy out of season holidaymaker, as incongruous as a swallow in December, taking a stroll along the seafront and persuading themselves that an ice cream would be just the right thing to eat, but it never was. One day, just before she was about to negotiate the two metre journey back to the front seat for the drive home, a gang of young schoolboys, no older than nine or ten were making their own way home along the front when they decided that a bit of ‘Brenda baiting’ would liven up their world. “Hey fatty pig smelly big belly wobble jelly, hey fatty pig smelly big belly wobble jelly” they chanted as they ran around the van hitting the sides with sticks and throwing stones that broke no bones but windows did. Brenda shouted at them “Go away, leave me alone”. She sat trembling, stuck in her van while the riotous cacophony ensued. After five minutes, satisfied that sufficient fun had been had and maximum distressed caused, boredom prompted the gang to move on to more interesting things. They didn’t touch Brenda but on the inside she felt broken. Scared out of her wits by stupid little boys and unable to even get up because of her gigantic bulk. She tried to move but couldn’t. She tried to turn but failed. “Oh hell, I’m stuck” she said to herself. Like an oversized pig-in-a-poke without a hope of moving an inch, she sat and cried and cried into her two-cone triple choc-topped fantasy, as her life flashed before her even quicker than most because there really wasn’t too much of interest to dwell on. The last one thousand six hundred and sixty nine calories in the last glorious ice cream symphony had finally proved to be her nemesis. Her downfall. Her descent into ice cream hell. It had tipped the balance of the scales decisively toward the wrong side of obese and turned her passage through the van from uncomfortably possible to impossibly hopeless. She continued to sob and cry all night long with the rain outside matching her tears drop for drop, hitting the thin metal roof of the van like a relentless child with a tin toy drum. In the pale excuse for dawn that started to invade the last death-throes of night and as the seagulls awoke to clear their throats to begin their strangled dawn chorus, a metaphorical knight in shining armour was about to arrive, galloping over the horizon. Well perhaps not quite galloping. This knight came in the none too alluring shape of Norman Tidy (who wasn’t). He was an otherwise not unpleasant looking man of a certain age, with thinning grey hair and a pipe cleaner physique, a hawk like nose and strong chin. He had, in his retirement years, taken to walking along the seafront at first drizzle each morning; his constitutional, he called it. As he approached the van he heard Brenda’s sobs of despair and decided to do something completely out of character – and help her. Not being one to usually jump to the aid of others, much preferring the usual British response of ‘turning the other cheek’, Norman, in this instance, sensed something a little different. He knocked on the van; Brenda stiffened deep down within her fleshy mass, dreading it being a return of the feral schoolchildren with their vicious sticks and callous rhymes. Happily for her though it was the rather ordinary features of Norman Tidy that presented themselves at the serving hatch window. “Stuck? Damn! Bad luck!” said Norman uncharacteristically. His recently deceased wife had hated to hear him swear, so now and again he liked to allow himself this minor privilege just to remind himself of his new found freedom. For freedom he now had; and money and he was without worries too but also without any meaningful occupation and so was always keeping his eyes open for what he called life’s golden opportunities. And within a split second of arriving upon this bizarre scene and assessing the situation, he thought to himself that he may well have just stumbled upon a first grade, top notch, humdinger of an opportunity. “Fancy a nice cup of tea?” he asks her. “That would be lovely” she says, at last believing in the kindness of strangers. So Norman Tidy, his brain already in overdrive hatching a plan, walked to the nearest caff (no acutely accented cafés round these parts) and brought back two steaming cups of polystyrene flavoured tea. “Least I can do” says Norman, already weighing up the options. “Can I sit inside your van and get out of this depressing drizzle so we can talk more easily? Now, nobody in the whole sorry, sad, history of Brenda Bagley had ever asked her out anywhere to do anything. This had just never happened before. “Really? You mean do something different? Go somewhere?” she said with that strange upward-sounding inflection she had picked up from watching too many Australian daytime soaps; you know, the one that puts a question mark inappropriately at the end of every statement? “Absolutely anywhere away from here will be just perfect” Brenda replied without truly thinking her statement through to any literal conclusion. So Norman Tidy turned the key in the ignition, started the engine and they hiccuped their way out of the seafront car park accompanied by the warped, warbling sound of the ice cream van’s out-of-tune tune. As they drove through the town which was even a shade greyer than yesterday, passing the depressing necessity of the ‘poundshops’, the boarded up ‘nothing’ shops and the anorak-clad residents, all pinched faces turned down out of the wind, she began to wonder about exactly what kind of adventure Norman Tidy may have in mind for her. “First things first” said Norman, “we need to get your van fixed and tidied up. I have a good friend with a car repair business not far away who will do me a favour”. He was already meticulously planning Brenda’s big surprise day, silently thinking to himself that bodywork repair is something Brenda could do with in more ways than one. “This is such a treat” she tells him. No one had ever shown her this much kindness in her life before. “I haven’t a clue how I can ever repay you”. “Oh don’t you worry about that, I am sure we can come to some arrangement” he replies casting an oddly smiling glance at her in the rearview mirror. She looked so happy, he thought as they arrived at the premises of ‘Pete’s Perfect Bodyworks – does yours?!!’. Pete had always had a sense of humour, thought Norman reading the badly handpainted sign above the railway arches as he eased the van into the cavern-like space. He went to chat with Pete in an office chaotic with piles of invoices and dodgy receipts, six month old VAT return forms, overflowing ashtrays, stained tea mugs and dubious calendars showing scantily clad young women draped over the latest supercars. Brenda, completely stuck and still firmly wedged between the back of the ice cream machine and the side of the van, watched the two men discussing the repairs to her pride and joy and could not help thinking how lucky she was to have met Norman Tidy that morning. Due to the very wedged-in nature of her position, the work would have to be carried out with Brenda still inside the van. “No matter! I have plenty to read” she said turning to the reassuring stash of trash mags next to her. The work did not take too long, maybe a couple of hours, no more and she was really delighted to see, this even included repainting her ice cream slogans. “To brighten things up a bit” said Norman with a hint of mischief in his eyes. “That will really help my business, thank you” said Brenda hardly believing her luck. “Certainly should do.” he replied, “I have you and business uppermost in my mind”. As they drove out of the arches into the sunlight, in her van with its new shiny bright colours she wondered where they might be going next. “Now I’m taking you on a mystery tour for your big surprise” said Norman. The day just keeps getting more exciting, thought Brenda. The newly-painted van was attracting an awful lot of attention as they made their way along the unfamiliar roads. The pair drove for an hour or so to a town she didn’t recognise. It was getting dark and she could hear a lot of excited noise ahead, they were going to a fair. Norman Tidy was taking her out to a funfair! When they approached the gates of the park and the entrance to the fairground a security guard waved the van through with a barely perceptible wink to Norman. This is like getting VIP treatment, she thought. Norman must have some very important friends here. As they drove into the fairground among the rides and side stalls she caught a glimpse of her newly painted van in a reflection on the side of a particularly well-polished caravan belonging to one of the fairground workers. Her van looked beautiful, all shiny and new and wonderful bright colours but it took her just a few seconds to read the back-to-front image of the new sign on her van. ROLL UP! ROLL UP! 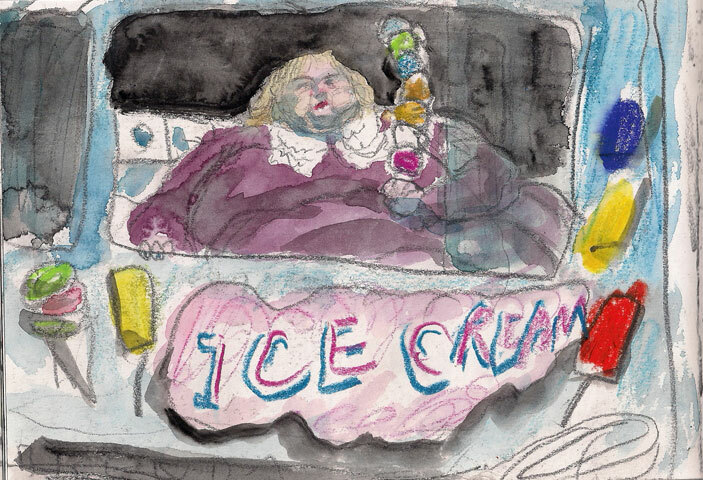 COME AND FEED THE ICE CREAM QUEEN – THE FATTEST LADY IN THE FAIR! SEE HER GROW BEFORE YOUR VERY EYES! ROLL UP! ROLL UP! And roll up they did in their hundreds, bringing in so much money. Tons of money in fact. More money than Brenda or Norman had ever seen in their lives before. Seeing this amazing reaction, Big Brenda Bagley and stick-thin Norman Tidy very quickly arrived at a decision to become business partners and take the van everywhere the fair went and so go on to make their fortunes. Like an oxpecker bird living on the back of a hippopotamous or a remoras suckerfish attached to a gigantic whale shark, this unlikely and odd couple were in fact a perfect example of a symbiotic relationship. And as the oxpecker eats the ticks and insects from the hippo’s back and the remoras cleans parasitic lice off the skin of the great whale shark, so Big Brenda Bagley pulls in the crowds to the funfair that keeps her in ice cream heaven and Norman Tidy in gainful occupation. One successfully living off the other in the ultimate partnership. Who knows, perhaps it was love? 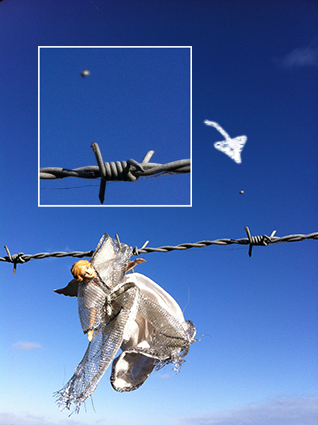 closer inspection of the photographs i took over the christmas period of the stranded angel caught in a barbed wire fence at port meadow, oxford, has revealed yet another mystery. there is what can only be described as a UFO clearly visible in the sky behind the angel. does this explain her appearance? did she arrive in this strange flying object and not by being blown across the country in the high winds as previously imagined? could she be more than ‘just’ another angel? NOTE – this is not a spoof photograph. i was as shocked as anyone could be when i noticed it. i took half a dozen shots all at the same time and at the same location. this is the only photo showing the UFO. i will swear to it.